Released on Thursday (February 12, 2015), SOLIDWORK’s new MBD Module (add-in with a cost of approximately $2,000) is a method to save presentation views, use a format-type template and translate your 3D SOLIDWORKS model into a 3D PDF. Which means, keeping the good stuff on the drawing and adding in the capability to rotate, zoom, pan, section and inspect from your product from all directions along side its geometric dimensions and tolerances (GD&T or PMI). If you have an assembly, it will capture different configurations, all to be viewed, rotated and manipulated inside a single viewable and lightweight digital file. A 3D PDF is a great container to hold pertinent TDP (Technical Data Package) information that defines all the information needed to manufacture, or just communicate your product design. It can be used for both parts and assemblies. The 3D PDF 3D model-viewing format is called a PRC (ISO 14739-1), but because a 3D PDF can have attachments, you can also embed a STEP file inside that PDF, or any other file format that your organization needs. Here are the three take-a-ways that I gleaned from this week. 1. MBD (Model-Based Definition) is just a piece of the larger Model-Based Enterprise (MBE) puzzle. 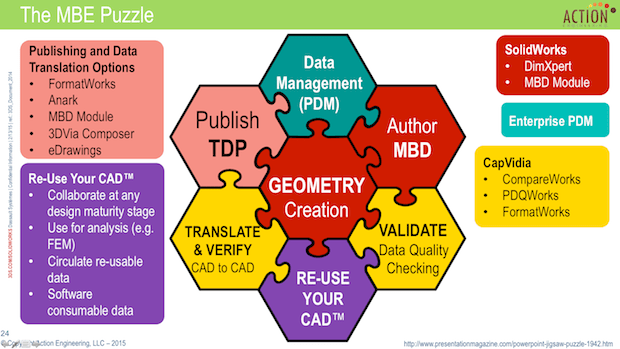 MBD is just a piece of the MBE puzzle. 2. Product data should be published for human consumption and in a software consumable format (dynamic parts lists / BOMs and semantic 3D annotations). 3. SOLIDWORKS is bringing MBD closer to the everyday CAD designer by making 3D annotations and publishing 3D PDFs more affordable by using SOLIDWORKS. Oh yes, and, if you use eDrawings internal to your organization, then use it even more with 3D associative DimXpert annotations. Annotations are displayed in eDrawings. Plus check out what Blake Reeves (a SOLIDWORKS developer) played around with. This is a visionary way to inspect your part (Immersive Manufacturing & Inspection), by projecting the PMI directly onto the actual part you are inspecting. Genius! PMI projected onto a 3D printed part. As always, SOLIDWORKS is focused on usability, a key to success for Model-Based Engineering (MBE). 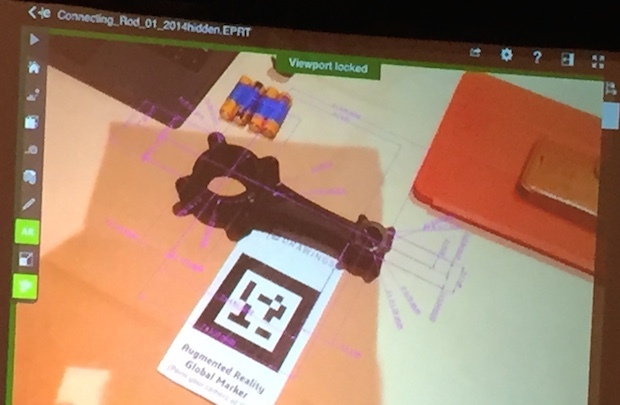 Neutral, Native, Inter-operable CAD? Is it time to get down to business? This entry was posted on Sunday, February 15th, 2015 at 6:41 PM. You can follow any responses to this entry through the RSS 2.0 feed. You can leave a response, or trackback from your own site.